Who can resist the cheer of the holiday season, especially when your home is decked out from top to bottom in gorgeous decorations? This year, you can make your home look even merrier and brighter than usual with the help of some custom holiday wall graphics from Vinyl Disorder. These affordable wall graphics are made to last, so you can use them on just about any surface in the house. Better way, these holiday wall graphics are removable and reusable, so you’ll be able to apply them year after year to add a pop of colorful décor to your home or business. Because Vinyl Disorder allows you to fully customize your wall graphics for Christmas, New Year’s Eve, Thanksgiving and other holidays, it’s easy to make sure this decoration matches your personal style. Go for something bright, bold and fun that will make the kids smile, like a cute elf wall graphic or a Santa wall graphic. For a more sophisticated setting, you could create a custom wall graphic that features an elegant holiday tree, berries and holly or a serene snowy landscape. Don’t forget that you include text in your design as well. You could include a holiday message like “Season’s Greetings” or add your family’s last name or your business name. Whatever your design includes, it will be printed on durable, high-quality wall fabric to ensure that you get a beautiful, sharp and eye-catching final image. Vinyl Disorder makes it easy to bring the custom wall graphics you’ve imagined into real, tangible products you’ll want to use again and again. You can make your own design and send it to us, or work with our graphic designers to come up with something totally unique. Our printed die-cut wall graphics are incredibly durable and feature rich, vibrant colors, so you’ll get a show-stopping custom holiday decoration with every order. Order your holiday wall graphics today so you’ll be ready to celebrate this year’s holiday season in style. 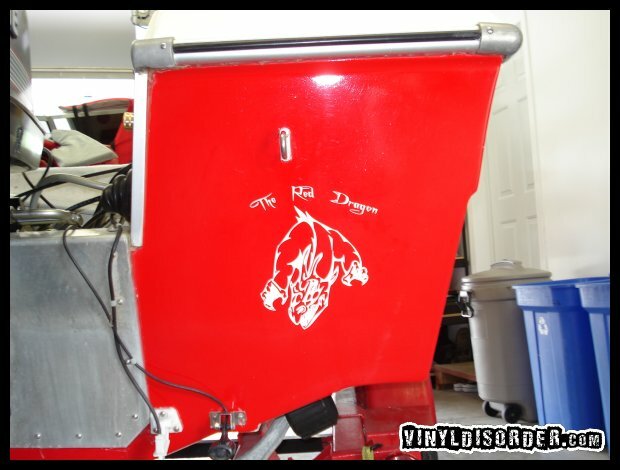 From gearheads to grease monkeys and all around car lovers, custom car decals from VinylDisorder.com are the perfect way to decorate your work and home space. Where can you place one of our car decals? Just about anywhere! Our decals will adhere to any smooth, flat hard surface. When you want to add some personality to your living quarters, or want to freshen up a space, decals are a simple way to make it happen. Have a basement, man cave or garage that you want to brand as your own? Our custom car decals are a unique, easy way to transform your favorite space. From lowriders and hot rods to exotic European models, go carts, sand rail decals and so much more, browsing our inventory is like shopping the world’s largest showroom. When considering decorating with car decals, think about how bold or minimalist you want to go. Decals that are 72 inches in length will definitely have a dramatic impact. If you have the wall space, a six foot decal of a 1967 Chevy Camaro on the wall of your garage will garner plenty of attention. If understated is more your style, scale your decal down to one that’s 15 inches in length. Welcome customers into your body shop or repair shop with an eye-catching display of a series of different makes and models placed around the shop. From whimsical cartoon decals of flame-shooting muscle cars to steering wheels, our decals are a unique way of making your business stand out from all the other typical garages. If tinkering under the hood is you more your thing, we even have decals of car parts. Decals of tachometers, spark plugs, wrenches and odometers are a fun way to bring your work area to life. Our durable, high-quality custom car decals are a great choice for renters. Landlords who firmly enforce a “no nails in the walls and no painting policy” will likely be fine with decals that can be removed without causing any damage. Do you love your car? Do you treat your motorcycle like a prized possession? If so, put your personal stamp on your vehicle with these unique custom text decals for cars, trucks, boats, motorcycles or anything else you like to ride. There’s something special about putting your name on your vehicle; it helps you take pride in your car or motorcycle while also letting other drivers on the road know who’s lucky enough to have such a cool ride. Lots of individuals who have saved up for that special car or motorcycle like to add their own name to an exterior panel. Meanwhile, you might find a family name across the back windshield of a minivan or beloved family pickup truck. While adding a custom name decal is certainly a great option, don’t feel that that’s your only choice when it comes to creating text decals. You can also use text to create just about any unique car decal you can think of. Add a nickname you’ve come up with for your bike on the side of your motorcycle, or place lyrics to your favorite song on the back windshield of your car. You can also add business names and slogans to the side of a vehicle for promotional purposes. The options are endless, allowing you to truly get that personalized touch you’re going for. 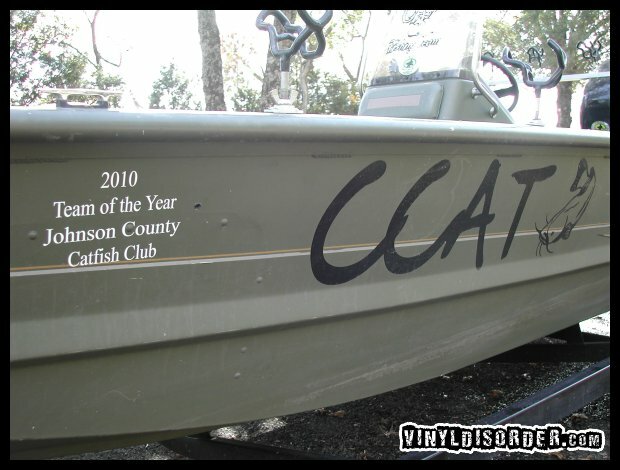 Custom text decals from Vinyl Disorder can made to fit just about any vehicle you have in mind. 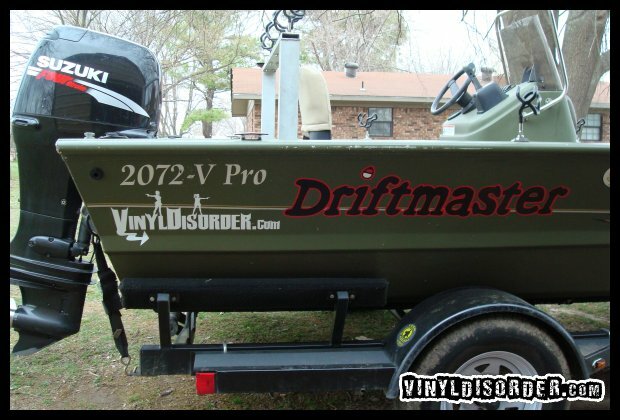 Get massive decals to put a name on the back of your boat, or add a small logo to your car’s windshield. You can also use text decals to put registration numbers on certain types of ATVs, jet skis and other recreational vehicles. Get creative and choose the style, size and colors you want. You can also go with our default Arial Bold font or choose one that is better suited to your unique style. Contact Vinyl Disorder to learn more about how custom text decals for motorcycles and cars can give your vehicle a personalized look. When your employees and customers enter your store, what do they see? If you want to make the very best first impression on everyone who enters one of your stores or office locations, consider adding one of these stunning custom floor graphics from Vinyl Disorder. One of these bright, fresh and colorful vinyl decals instantly spruces up the room. Business owners love that it’s a unique and creative approach to adding branding to a space without being too flashy. Instead, these custom floor graphics look sleek, subtle and undeniably professional. One of the concerns many customers have with floor decals is how they’ll hold up. After all, think of how many people might trudge over them day after day, possibly with wet or muddy shoes. 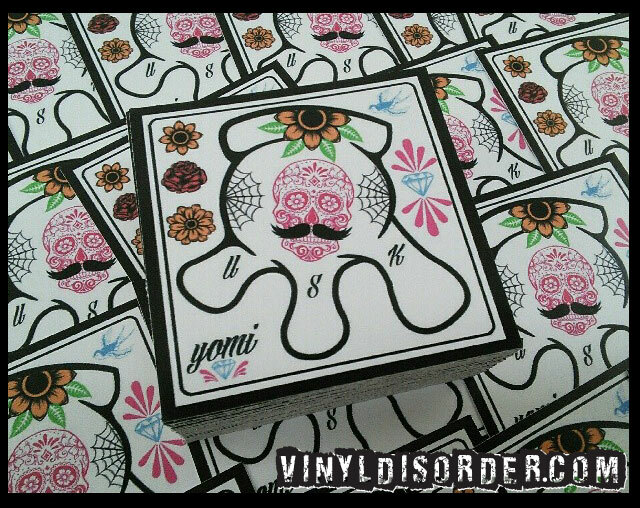 But when you order from Vinyl Disorder, you don’t have to worry about your custom floor graphics falling apart. These high-quality decals are printed on durable vinyl that is waterproof and weather-proof. It’s made to last even when placed in high-traffic areas. Even better, these decals feature a non-slip laminate surface that serves two purposes. First, it protects against the elements and second, it protects against accidental slips and falls even when the graphic is exposed to moisture. Knowing that a graphic is safe for your floor is one thing, but what about the design? The great thing about custom floor graphics from Vinyl Disorder is that you’ll be able to create a completely custom look for your decal. Everything from the shape, the size and the colors can be selected by hand. You can even choose a favorite font or incorporate your company logo. Get in touch with us to learn more about the many option for customizing your business floor. Whether you have a café, a grocery store, an arcade, a restaurant or a busy office building, you’ll love the way these vinyl decals for floors add a unique look to your location. Looking for a way to make your small business stand out? Consider adding a colorful and custom touch to the customer seating area with custom wall graphics. These vinyl wall decals are an affordable alternative to overpriced artwork or custom-painted murals. But despite the lower price, you won’t have to sacrifice when it comes to quality and style. Vinyl Disorder’s custom wall graphics look seamless on your walls, take just minutes to apply and will hold up for years to come. That makes them a smart investment for adding custom branding to your business locations. One of the things that makes custom artwork for businesses so expensive is the need to involve a professional designer. This can be a particularly costly part of the process, but at Vinyl Disorder, you’ll get that assistance for free. We work with business owners who need a custom design all the time, so we know exactly how to make your vision come to life. Whether you want a huge custom wall graphic with your logo, your business name, a clever quote or information about your business, we’ll help you make it happen. You can send in an image or something you designed on your own. Or, you can contact us and describe what you have in mind and we’ll come up with some ideas to make it happen. Custom wall graphics certainly make your business look more professional. Having that type of non-generic artwork gives your storefront or seating area a stand-out look without a doubt. But there’s another advantage to adding this kind of personal touch to your store. Custom wall decals also create a welcoming environment for customers. It makes it the type of place that they enjoy spending time in and want to return to in the future. That’s an invaluable feature that any smart business owner will want for their locations, so be sure to order vinyl wall decals with the exact design, size and color that suits your marketing needs. Check out a few of our newest prints! 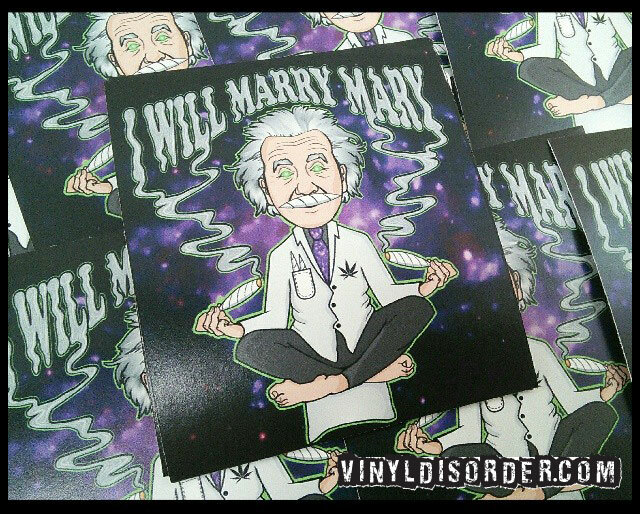 Our digital printed stickers look awesome. You can get some prints of your own designs as well! 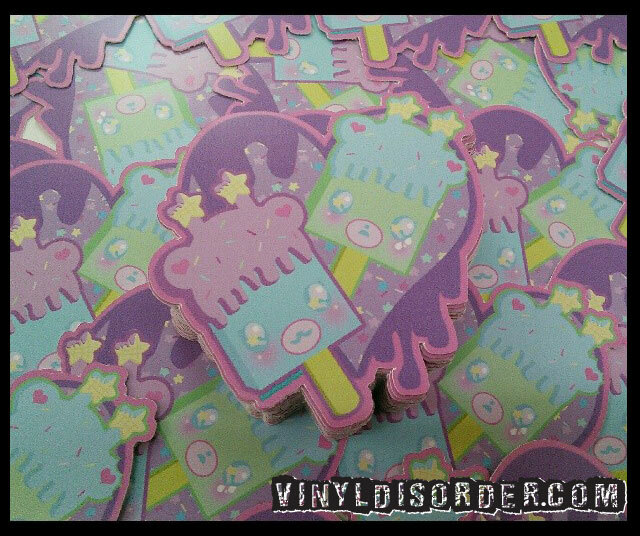 Just email the design to sales@vinyldisorder.com and let us know how many you want, the size and shape and we will have them printed and shipped out to you in no time! 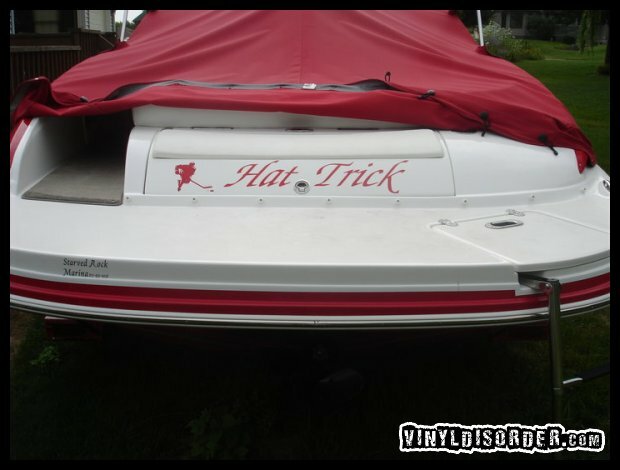 Do you have a boat and want to put the name on the back or side of the boat? 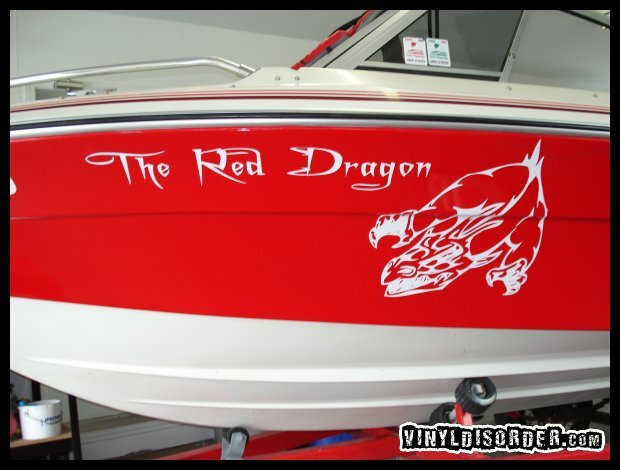 Or maybe you have an existing name on your boat but it is fading or wearing off and you need a new one. We can help you get the perfect custom design to make your boat uniquely yours. All you have to do is email us the dimensions for your text, the font, color and the actual text and we will create an awesome design just for you! If you have a former design that you would like redone, send in a photo and we will look into recreating something similar to that design for you. 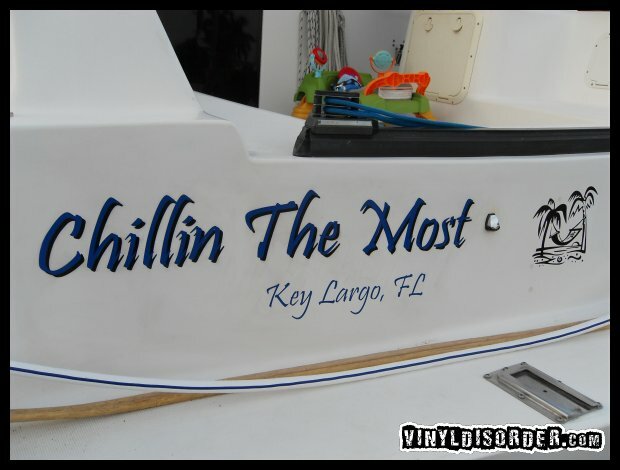 Below are a couple custom boat decals we have created. Our outdoor grade vinyl is waterproof, weatherproof AND has UV protection so it is perfectly fit to last on the outside of a boat. If you want to see a sample of a type of material or color we have them available to order here on our site! Did you know we can do large custom prints?! Do you have a large fridge, tool box, or photobooth that could use a little fixing up or just needs a brand new look? Or maybe you just got a kegerator that you want dec’d out for your new man cave! Check this one out! 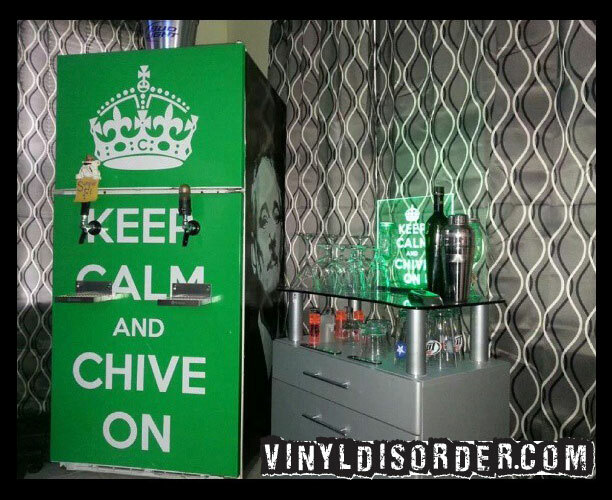 CUSTOM PRINT ON A KEGERATOR FOR A MAN CAVE – This full on themed room looks pretty sweet! 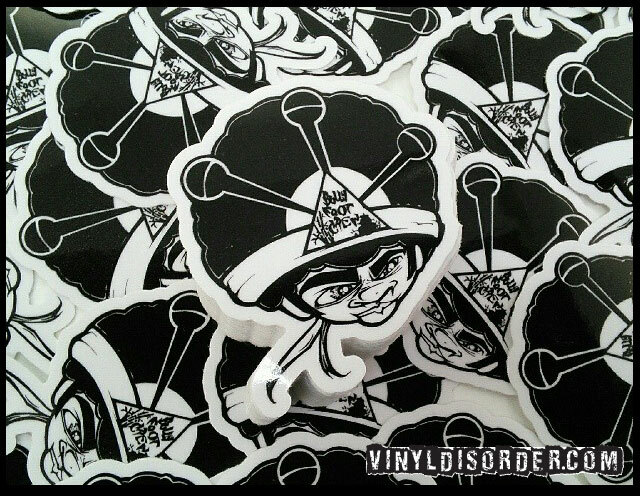 Whatever your next big project is, we can help you make it happen here at Vinyl Disorder! Send us your custom image with your desired dimensions and we will print and cut it to perfectly fit your surface!